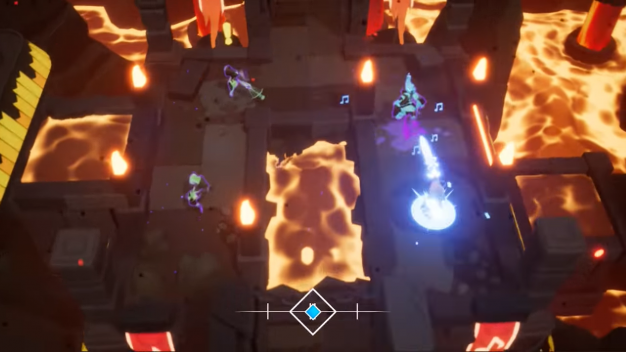 Soundfall is an upbeat action/adventure game focused on music, rhythm, and an underlying beat which is at the core of everything you do. Over the course of the game you’ll apparently befriend endearing allies, wield powerful abilities and legendary weapons against a horde of malicious adversaries as you race to halt the return of an unfathomable darkness, Discord. If you’re getting the sense that the demo didn’t have much to offer in terms of anything related to the story, you would be correct. However, it did offer a pretty good screenshot of what the gameplay is like. Each of the three levels involves you appearing at one end of a dungeon and a song beginning to play. You are reminded that you must reach the end of the dungeon before the song ends. There’s a little beat meter thing at the bottom of the screen that tells you whether your gun shots or melee weapon strikes hit at the same time that the beat reaches the little diamond in the middle of the beat meter. However, the game doesn’t really explain what benefit matching your strikes and shots to the beat offers. In some cases it’s obvious – there are times where you have to quickly traverse across beams of light and this is done smoothly by matching your movements to the beat. It also looks really cool when you get it right, although it’s not that easy to do on your first few tries. Smacking enemies around felt good, particularly when I built enough energy for my special spinning move which easily takes out lots of goons at once (I’m beginning to think that timing your strikes is what fills up your energy). There’s no penalty for not striking on the beat, which is good because the faster beats are near impossible to time well while also paying attention to what you’re doing. I could easily time my attacks with the beat meter but not pay attention to the battle and vice versa. I have no real suggestions for how to implement that better, because obviously timing your hits with the beat is an integral part of this music-based game, but unless you really, really sink into the music you’re not going to be hitting all the notes perfectly. The environments are pretty and weirdly the detail and enemies remind me of something like in the first Jak and Daxter game, which is fun. It’s got that blocky platformer look with lots of bright, inviting colours. It feels smooth to run around and attacking feels good. You can pick up lots of different weapons in the middle of the dungeon or obtain more after you’ve successfully completed a mission. The guns feel varied and fun to fire, so Drastic Games have definitely made a game that’s fun to play. If it weren’t for the obvious music emphasis I’d be tempted to tell them to do away with the beat meter entirely. 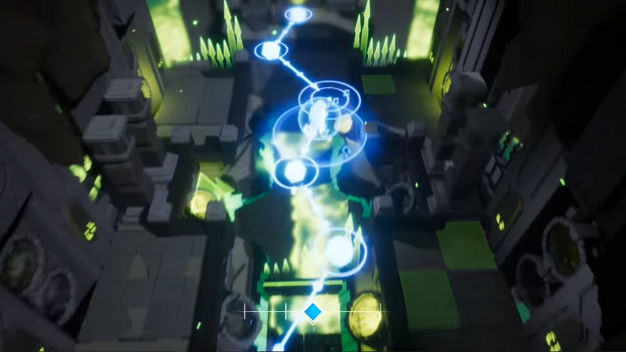 It may even be better to have button prompts above enemies to time with the music, although that would be more graphically-demanding and probably way, way harder to code. The music is very synth-y and club-y, and they were pretty good across the board, though nothing super exciting. The full version of the game will undoubtedly have a lot more to choose from, which will hopefully add more in the way of variety. Overall, I’d say to watch this one carefully. Other people may not have as much of an issue dividing their attention like I mentioned, but I feel like I’d just end up ignoring it most of the time, seeing as I was able to build up nice combos and energy for my special moves regardless of my skill hitting the right beats. 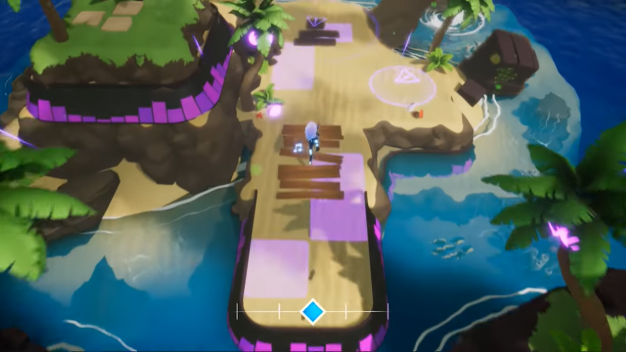 Soundfall is still in development, but it’ll be coming out on PC, PS4, Nintendo Switch and Xbox One, so it’s really appealing to just about everyone. Keep a close eye on this one, it may end up being a great one. It’s a unique idea and I’d love to see it when it’s finished, especially if they do implement some multiplayer like the demo suggests. This preview is based on a demo provided by the publisher. Monique hails from Australia and shares her life and couch space with her boyfriend and talkative tuxedo cat.